Again it has taken a tragedy – this time, the jihadi massacres of Yezidi Kurds on the slopes of northern Iraq’s Mount Sinjar – to focus international attention on the Kurds and on how precarious their lives can be. Yet beyond such drama, recent trips among Turkish, Syrian and Iraqi Kurds have made me conscious of a new surge of self-assurance and intertwining in this once-marginalised and disparate group of peoples, who number perhaps 25-30 million people between Turkey, Iraq, Syria and Iran. 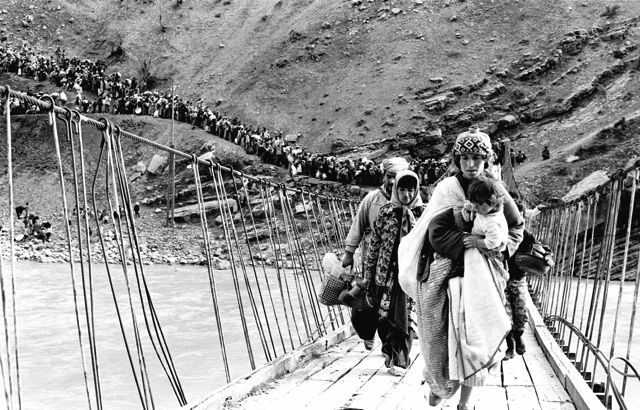 Kurds have been victims of terrible events, like Saddam Hussein’s 1988 Halabja chemical weapons attack, or, as here in Turkey in 1991, forced to flee to neighbouring countries as the Iraqi president’s troops attacked after the first Gulf War. On a July trip through northern Iraq, the Iraqi Kurds’ Kurdistan Regional Government (KRG) looked more prosperous and autonomous than ever, part of a two-decade-long trend of development that has persuaded the U.S. President to tell the New York Times it is “functional the way we would like to see”. And despite the KRG’s real shortcomings – contested territorial ambitions, poor governance and a tendency for its fabled peshmerga fighters to run away to fight another day – the Iraqi Kurds’ relative success is also part of broader new Kurdish ambitions and recognition. In Syria, whose Kurdish minority was almost invisible to outsiders until a year or two ago, the main Kurdish militia has carved out three relatively autonomous cantons. It has so far held its ground against the jihadists of the Islamic State with little outside aid and – despite some early rivalry with the KRG – helped the Iraqi Kurd peshmerga defend the Yazidis and hit back against the jihadis inside Iraq. In a rarely seen moment of Kurdish solidarity, Turkish Kurd fighters have now also joined the front lines of both Iraqi Kurd peshmerga and Syrian Kurd militia. More than half of the world’s Kurds live in Turkey, and they are tasting new success there too. After 30 years of fighting the main insurgent Kurdistan Workers’ Party (PKK), top Turkish and PKK officials now say they think it unlikely they can defeat each other militarily, and peace talks are making progress. Even non-PKK Kurds in Diyarbakir now speak glowingly of trying to win the kind of autonomy that the Iraqi Kurds enjoy. And on August 10, an unabashed Turkish Kurd national movement leader won nearly 10 per cent of the overall vote as a presidential candidate in Turkey – sweeping in first in 11 provinces in southeastern Turkey. 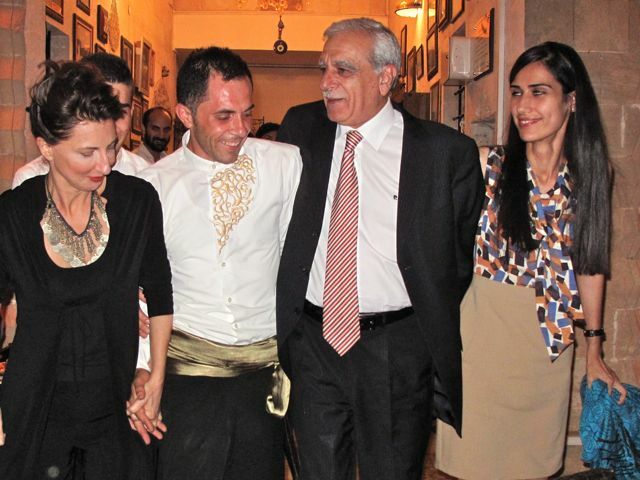 Much-jailed Turkish Kurd leader Ahmet Türk (second from right) dances at a party two months after his March 2014 election as the municipal mayor of a major Kurdish-majority province in Turkey. On the right is his co-maor, Syriac Orthodox Christian Februniye Akyol. There are deep cracks in the foundations of this Kurdish progress: clashes of interest with neighbouring Turkish, Iranian and Arab states, the Kurds’ disconnected mountain geography, their divided tribal societies, and their four main dialects, which are mutually hard to understand. Iraqi Kurds have yet to prove they can prosper without their share of oil income from Baghdad, have occupied territory well beyond what their Arab and other neighbours consider to be fair and have kept a tight rein on KRG media. 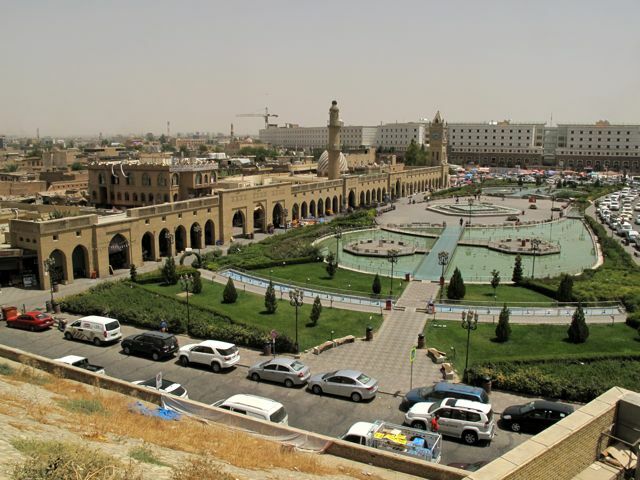 A foreign security expert resident in the KRG told me there were increasing fears of a domestic backlash against the alleged corruption and concentration of wealth in the ruling elite – epitomised by the ownership of some of Erbil’s grandest building projects. The wounds of internecine strife in the 1990s are still unhealed: inside the KRG’s own territory, I still passed through checkpoints that divide the region up between at least three armed factions. In Syria, the main Kurdish organisation faces long term liabilities, with threats from jihadists on one side, and continued links with the Syrian regime on the other (for instance, see Crisis Group’s May 2014 report Flight of Icarus: The PYD’s Precarious Rise in Syria). Turkey’s main Kurdish movement is beholden to armed insurgents, the Kurdistan Workers Party (PKK), which itself is burdened with a designation as an international terrorist group (more here). And, beyond news of occasional executions, Iran lets slip little information about the situation of its Kurds, two of whose most important leaders were murdered in exile by gunmen linked to Tehran in 1989 and 1992 (a book with rare and compelling reporting on one of these killings can be found here). Nevertheless, many changes seem almost miraculous. 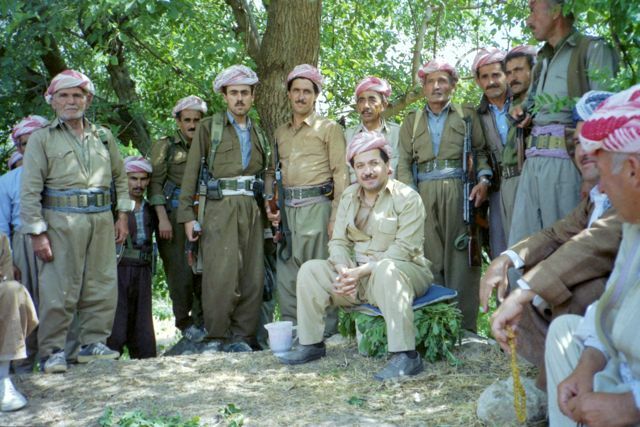 When I first met KRG President Masoud Barzani during the Iran-Iraq war in 1985 – he was then a young guerrilla chief fighting on the Iranian side, and the Iranian army helicoptered us in for a surprise visit to his Loulan camp in a remote mountain corner of northern Iraq – nobody in my group of a dozen journalists had much idea who he or the Kurds really were. When I started visiting Turkey in 1980, few non-Kurds seemed to care that the government was still ordering its officials to deny that the country’s Kurds existed and to call them “Mountain Turks”. In the 1990s, when I tried to pitch a story on the region’s Kurds to the Los Angeles Times, a kindly editor wrote back to advise me “don’t put the word ‘Kurd’ in [your proposal] … To us, it guarantees that we won’t understand the story”. In 1991, as a reporter I witnessed the stumbling dawn of Iraq’s Kurdistan Regional Government. Back then, travel between major cities took hours on dizzying, broken-down mountain roads. Vehicles were falling apart and smuggled fuel was (and often still is) sold in barrels and plastic jerry cans. All around us villages had been flattened into non-existence, often with not a stone left standing on another, sad evidence of Saddam Hussein’s genocidal scorched-earth policies. Village houses flattened by Saddam Hussein, 1992 (left) Kurds crossing the Tigris from Syria to Iraq, 2002 (right). Two decades later, a Kurdistan has emerged, even if its legal status remains something of an elastic envelope. Iraqi Kurds seem to be able to use their growing international recognition and support to keep on pushing out, waiting, and pushing out again. Entering the KRG no longer needs a ride on a tin-tub speedboat across the Tigris River or shadowy permits from Syrian intelligence: there are now direct international flights to Erbil airport and its sleek tubular arches, and KRG border police stamp a welcome into many country’s passports without demanding a visa. To go on to Baghdad, however, a proper Iraqi visa is needed. Not surprisingly for a people for whom smuggling between neighbouring states has long been a way of life, the American dollar is as good a currency as the Iraqi dinar. The newest computers, top-of-the-line cameras and surveillance equipment are carted off to the rest of Iraq, Iran and Turkey from Erbil’s bustling electronics district, which charges lower prices than New York, partly because nothing seems to be taxed. Things don’t always work out. Because Baghdad insists all Iraqi oil must be marketed through the central government [corrected: see below], two tankers full of the Iraqi Kurds’ first oil shipments that used an Iraqi pipeline through Turkey were kept floating off the U.S. coast for weeks in a legal limbo this summer. But some Kurdish oil is finding buyers. Breaking the Ramadan fast at a falafel seller in a renovated part of Erbil’s city centre. Growing assertiveness is showing in Kurdish languages and cultures. When I traveled to Iraqi Kurdistan in the 1990s and early 2000s, outsiders mostly used Iraq’s national language of Arabic for work. When the Kurdish zone expanded anew during the 2003 war, I moved with Kurdish fighters into territory formerly held by the deposed Saddam Hussein regime — once again into Kurdish towns with shop signs only in Arabic. Domestically, a main concern for Masoud Barzani’s region-wide television station has been to coin a new kind of high Kurdish as a language that would be understood through the whole territory. This is still a work in progress: a refugee Syrian Kurdish schoolteacher in Erbil told me in July that after nearly a year here he still couldn’t fully understand the Iraqi Kurds’ main east-central Sorani dialect. Arabic, however, was much less known to those educated after 1991. “Learn Kurdish!” the two young men who drove me across the country ended up yelling in frustration as our conversation reached another dead end. It was true: anybody seeking to operate effectively outside the English-speakers in Iraqi Kurdistan’s elite now needs to do just that. 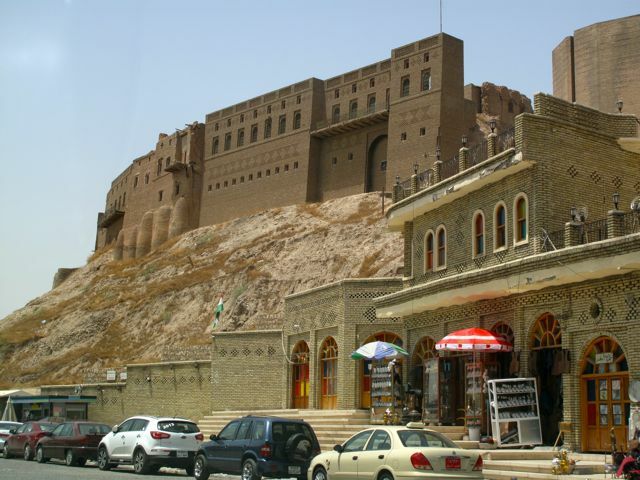 The city of Erbil, now the KRG capital, is still dominated by its ‘castle’, an oval of fortifications and brick mansions on the site of an ancient settlement or ‘tel’ that through history has risen 50 meters over the plains around. The castle is being restored and the city is in the throes of a rapid transformation. Concentric ring roads are expanding like ripples in what has become a concrete sea. Wide highways are well-paved and busy with new-looking, sometimes expensive cars. One of the biggest buildings in the city used to be the Saddam-era regional parliament building; now it’s hard to spot. At the same time, large parks have been laid out that attract crowds after the heat of the day. In old parts of Erbil a few old low-rise brick houses (above left) can still be found. But they are giving way to 20-story luxury mall-and-residence complexes. New-build housing estates now extend far into the surrounding plains (above right) and hills to the north. Several new glittering malls (like the Royal Mall, above left) compete for attention from the elites. Construction is under way to rebuild the more popular Kayseri Market in the city center (above right), where straw-coloured brick vaults now frame bazaar shops that sell everything from Kurdish cradles and carpets to dried vegetables, gold and mountain honey. Soon there will be nothing left of the old corrugated iron roofs riddled with holes, a continued legacy of the malevolent neglect of Saddam Hussein’s rule. A new sense of Kurdish pride can be felt, too, from the first ‘Welcome to Kurdistan’ sign in the airport bank ads to the vast flag that now flies over the Erbil castle (above left). After years of Iraqi oppression of Kurdishness, one petrol station (above right) seemed to feel the need to plaster the word ‘Kurd’ everywhere. Back in 1991, just after renewed Western protection gave the Iraqi Kurds their road to more autonomy, if people wanted to fly the sunburst flag of Kurdistan, they had to draw it by hand on pieces of paper. Between long stretches of empty mountains, there are still storks on the electricity pylons and great herds of sheep and goats. But the places where the roads now turn into the jarring old bone-shakers mostly seem to be where a dam or bridge is being built nearby. The countryside is busy too: towns given over to the production of concrete breeze-blocks, or valleys in which the newly rich find hills and outcrops on which to build their own private villa-castles as summer weekend retreats. Old flat-roofed mountain villages stepped up the mountainsides have become rarer but still possible to see. In a sign that KRG President Barzani also remembers the precariousness of the past, however, he prudently keeps his main residence and workplace on a hard-to-attack ridge in the first line of mountain foothills north of Erbil. For sure, the Kurds have a long way to go, and any independent state, for instance, would prove much harder than it looks. 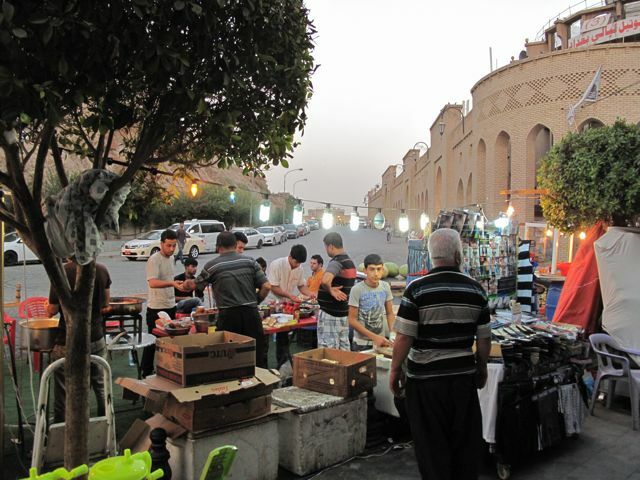 Weeks after my visit to Erbil, judged safe for travellers in recent years, the city came under threat of direct attack by the jihadists from the new Islamic State. But, with help from Syrian and Turkish Kurds, its defenses have not crumbled. Such cooperation, until recently unthinkable, are part of the recent intertwining of the fates of the Iraqi Kurds’ KRG, Turkish Kurds and Syrian Kurds. 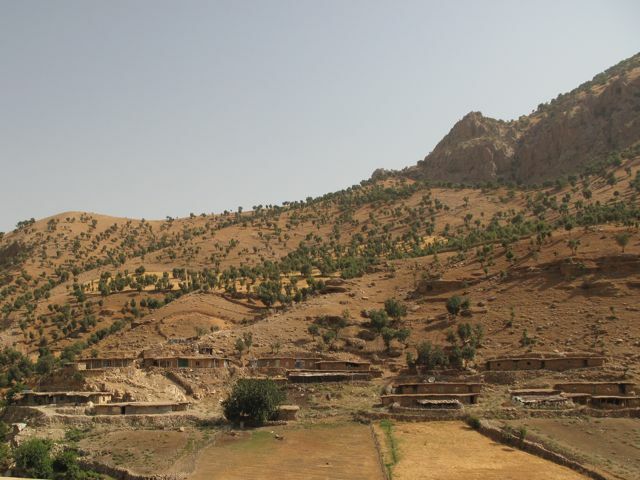 This could be seen not just in the operations to save the Yezidis and others but also somewhere as remote as the PKK headquarters, at times attacked and often only grudgingly tolerated by the KRG in the remote Qandil Valley. The KRG authorities have now extended a new line of electricity poles, cellphone service and a good main road to the small Iraqi Kurdish villages there. Villagers live in apparent harmony with PKK checkpoints and the presence of hundreds, if not thousands, of Turkish Kurd insurgents camped out in the mountains above. Another powerfully revived link is between Syrian and Turkish Kurds, with perhaps 250,000 Syrian Kurds fleeing to Kurdish areas of Turkey in the past year (described in my Crisis Group blog here) and Turkish Kurds giving military and humanitarian aid to their cousins in Syria. The PKK’s cemetery and parade ground in Qandil Valley. Alongside Qandil’s well-built Iraqi Kurdish village houses, squabbling ducks in the water canals and peach orchards heavy with fruit, a number of buildings lie flattened after attacks on the PKK by the Turkish Air Force in recent years. But even here, there is hope of change and peace after 30 years of a war that has killed at least 30,000 people on both sides. The PKK is becoming more open too, and won some of its first positive press in the West for their role in defending the Yezidi Kurds in Sinjar from jihadi attack (for instance, in Prospect Magazine and the Daily Beast). 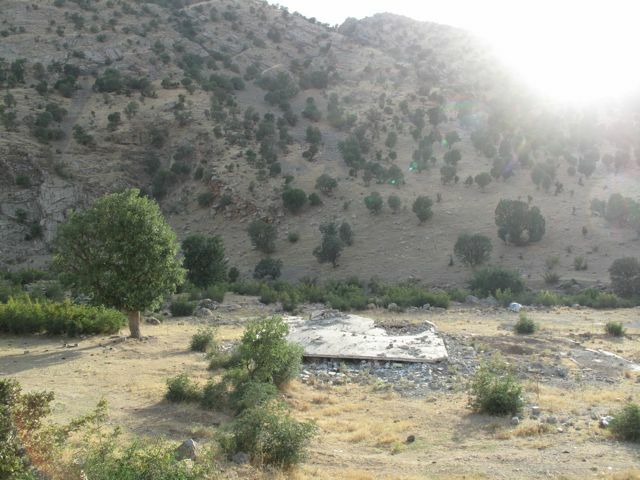 Village house in Qandil said by the PKK to have been flattened by Turkish Air Force action. 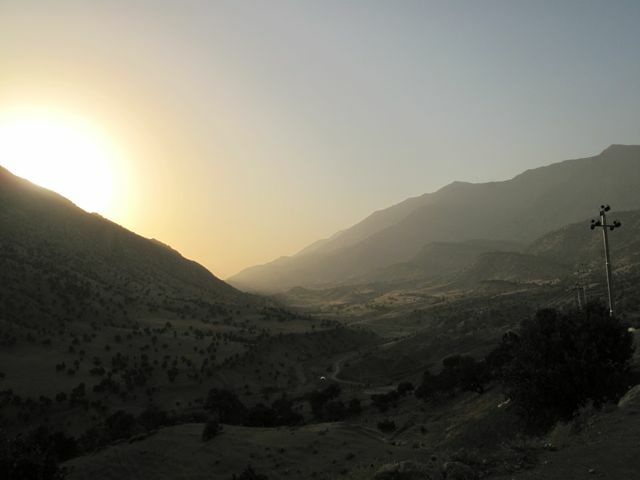 Long journeys from little-known places by determined, well-organized people can sometimes reach their goal: Qandil is not far as the crow flies from Loulan, where I first met Barzani earlier in his Kurdish struggle 30 years ago. Passing the last PKK checkpoint on my way home, I asked one of the Turkish Kurd insurgents about what lay behind his dedication to a cause and an organisation that required him to live indefinitely without pay, without holidays, without families, and without a love life. He laughed wryly and took the long view of a true believer. This version of the article article has removed an incorrect reference to sales of Iraqi Kurdish oil having to be directed through Baghdad according to U.S. and international law.